Britain is remarkably civilised in its provision of Public Toilets - certainly by my experience of many foreign countries! 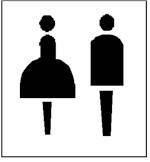 Most town centres are well served by toilets, which are marked with the internationally recognised signs and the words "Ladies" or "Women" and "Gents" or "Gentlemen". If unable to find one, you would ask someone for the "Ladies" or "Gents" (as the case may be). If you use the more obscure terms like "bathroom", you may well be met with wonderment from people who cannot imagine why you wish to take a bath in the middle of Little Wapping High Street. Nobody will be offended if you ask for the "Toilets" or "Loos"
Railway stations and Airports obviously have toilets. Some of these are now charging you for the privilege of entering, but if they do it is clearly marked at the entrance. The attendants do not require tipped. You may well feel that the attendants in the sniffier London hotels are trying to blackmail you for tips, ignore them, tipping is not necessary or required. Public toilets in remote spots may well be somewhat Spartan, and not regularly maintained. Be grateful that they are there.